2 PK stay Put XL Breathable Super Absorbent Kennel Floor Liners. Fold to fit many sizes. Total pad size is 24″ x 31″. A fantastic product. I was worrying about finding all the appropriate items for shipping my dog. Having it all in one package is fantastic. Easy to put together, understand, and use. 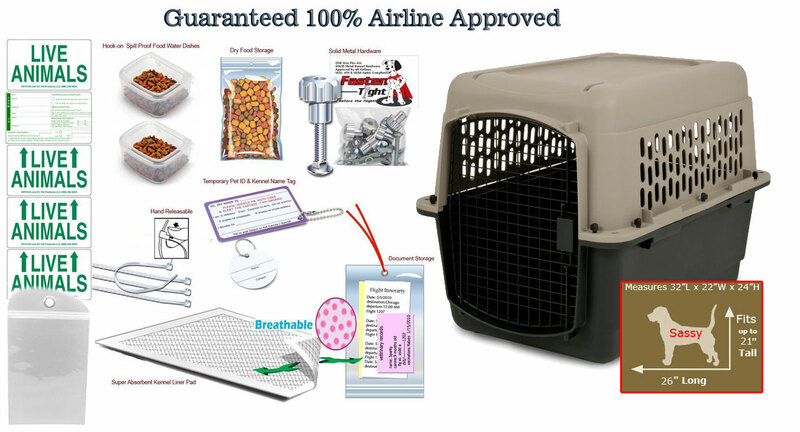 I would recommend this to ANYONE travelling with a pet. It took maybe 30 Min to assemble. special thanks for the peace of mind with our pet carrier and Sue for her knowledge and helpfulness! we just arrived without any issues what so ever! a 6 yr old schnauzer from ohio to oman! the food and water dishes stayed in place and he actually used them. the entire kit was well worth the money spent vs the wasted money we would have had with a store bought crate and all the extras needed! thank you! thank you! thank you!